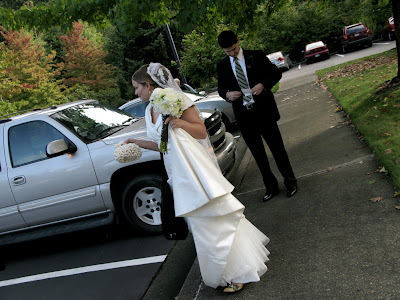 That Bride: That Wedding: To Wed! To Wed! That Wedding: To Wed! To Wed! After I rushed everyone out of the woods there were quick hugs all around (I'm usually really casual about whether I show up to things on time, but the day before the wedding we visited the temple and I had a breakdown when we walked in 2 minutes late. 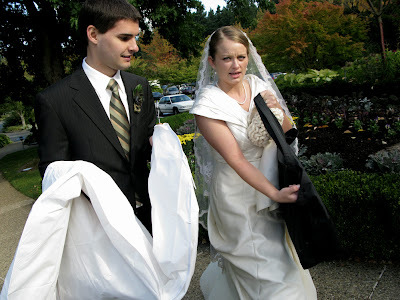 I didn't want a repeat on the wedding day.) It was so sad to say goodbye to That Sister, MOH Shay. Since she is not yet endowed she was not able to attend the sealing. We'd known almost our entire lives that this would probably be the case, but it was still hard to say "See you when I am a Mrs!" The closer it got, the more demanding I became. I think I am saying "Someone needs to come get my flowers from me! I can't carry all of these things at once." I'm joking about being crazy about being on time. 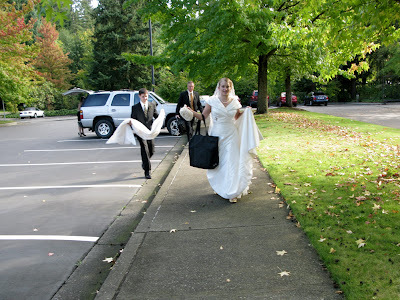 I was yelling over my shoulder "That Groom hurry up! We're going to be late!" He was so kind and patient and carried my mom's dress in without a word. That is definitely the face of someone who needs to relax. Luckily there are no more faces like that for the rest of the day. Hooray! See all of those people in front of us? They are actually gathered outside to greet another bride and groom on their way out of the temple. I was so nervous the bride and groom would decided to come out right when we approached and that we would run into them and spoil their big moment! We made it through the crowds and we were in! I think that many of you wonder what a temple sealing is like. For most it is very difficult to comprehend being married in a place where all those who we love most can't be present. Being in the temple is the most beautiful experience I have ever had the privilege to undertake. 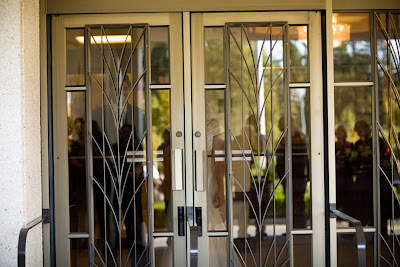 As difficult of a choice as it was for my husband (his parents were not able to attend), I know that neither of us regret choosing to be sealed in the temple for time and all eternity. The entire experience was serene, hallowed, and glorious. After changing into my mom's wedding dress, I was led into a small room to meet That Groom. We met with the officiant who would be presiding over a sealing, and he spent a few minutes asking us questions and getting to know us. I waved at our family and friends as they walked by us on the way to the sealing room. When all of our friend and family had been seated, it was time. We were led into a room that looks much like this one. An altar sits in the middle of the room, flanked by large mirrors on either side. These mirrors are included in every sealing room in all the temples around the world (to my knowledge). Setting the two mirrors across from each other creates a reflection in each that seems to go on forever. It is a very visual reminder that the covenant of marriage we are about to enter into will last through death and on into eternity. “Today is your wedding day. You are caught up in the emotion of your marriage. Temples were built as a sanctuary for such ordinances as this. We are not in the world. The things of the world do not apply here and should have no influence upon what we do here. We have come out of the world into the temple of the Lord. This becomes the most important day of your lives. “You were born, invited to earth, by parents who prepared a mortal tabernacle for your spirit to inhabit. Each of you has been baptized. Baptism, a sacred ordinance, is symbolic of a cleansing, symbolic of death and resurrection, symbolic of coming forward in a newness of life. It contemplates repentance and a remission of sins. The sacrament of the Lord’s Supper is a renewal of the covenant of baptism, and we can, if we live for it, retain a remission of our sins. “You, the groom, were ordained to the priesthood. You had first conferred upon you the Aaronic Priesthood and probably have progressed through all the offices thereof—deacon, teacher, and priest. Then the day came when you were found worthy to receive the Melchizedek Priesthood. That priesthood, the higher priesthood, is defined as the priesthood after the holiest order of God, or the Holy Priesthood after the Order of the Son of God (see Alma 13:18; Hel. 8:18; D&C 107:2–4). You were given an office in the priesthood. You are now an elder. “Each of you has received your endowment. In that endowment you received an investment of eternal potential. But all of these things, in one sense, were preliminary and preparatory to your coming to the altar to be sealed as husband and wife for time and for all eternity. You now become a family, free to act in the creation of life, to have the opportunity through devotion and sacrifice to bring children into the world and to raise them and foster them safely through their mortal existence; to see them come one day, as you have come, to participate in these sacred temple ordinances. We were pronounced man and wife (at exactly 12:48 according to my uncle), we kissed, I cried. Afterward those in attendance filed past us out of the room, hugging and kissing us in acts of congratulations. We separated briefly while I went back to the brides room to change into my wedding dress and then I met up with my new husband in the lobby. 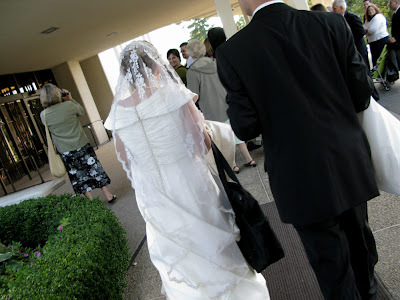 I clutched his hand and we walked out into the sunshine together as man and wife, greeted by the sound of applause and cheers and an all-encompassing feeling of love from our family and friends. I'm going to throw you for a loop this time and say that all photos, unless otherwise noted were taken by That Mother! Hooray, you did it! Congratulations again (I feel like it just happened!) and thanks for telling us what you could about the sealing, it was very interesting. So with the sealing, does the temple do a lot a day or just a few? I am curious as you ran into the family of another couple. 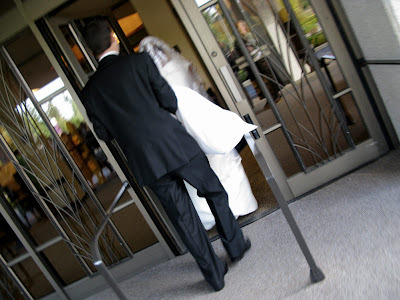 Also do you do any pre-marital meetings with the officiant or anyone else associated with the temple? Sorry if I'm a curious cat, it's really interesting to learn about other relegions and ceremonies. Especially a wedding that Hollywood has one version of but everyone across the world has their own version. Blab-Keep those questions coming my dear! No problem answering them at all. During the Summer months there are many many sealings every Saturday. Depending on how many sealing rooms the temple has I would guess at least 20, maybe more. When I went to two weddings at the Bountiful temple this Summer, both times there were 2 or 3 brides walking around the grounds taking photos (at once!) and another group of family and friends waiting for the couple to emerge. It can be kind of funny because the brides are all maneuvering to take pictures in the same spot! 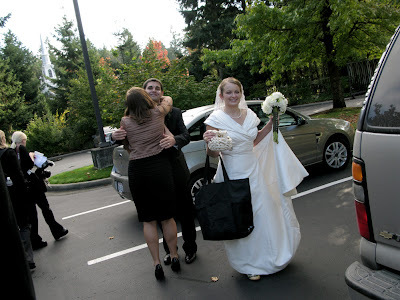 That was the first time we had met our officiant (and it is like that with 99% of couples, unless you have someone in your family or a close friend who is able to perform the sealing for you). There is no type of counseling required, just a temple recommend interview with 2 different church leaders beforehand. I love reading what I can about the temple sealing, it is wonderful to know more about your faith. I love the "need to relax" look on your face-- I totally get that same look. Keep the recaps coming, I just love reading about your wedding day!